The Super Soaker Monster (2001) represents the first mid-sized blaster which truly balances CPS power and multiple nozzles while having both regular and SC-capability. Unlike its larger, older brethren, the Monster (2001) is shorter and lighter, making it a blaster that is very enjoyable and easy to use on the water war field. Its reservoir holds a respectable amount of water (2.2L) for a blaster its size (basically equal to the Super Soaker CPS 1200 capacity). Its firing chamber appears to be able to unleash a little more water than the Super Soaker Monster X can! The Monster (2001) has four (4) nozzle selections from which one can choose: 2.5x, 4x, 8.5x and Fan Blast. The 2.5x nozzle allows the user to conserve water as well as increase firing time. This setting is good to use when the main reservoir is running low. The 4x nozzle produces a nice mid-sized stream capable of soaking one's foes quite quickly while not draining the Monster's resources all at once. For a blaster this size, the 4x nozzle is a good setting for general use when on patrols or when dealing with minor enemy engagements. The 8.5x nozzle is meant for heavy assaults. The output of the Monster is increased significantly over the 4x nozzle, but firing time is dramatically reduced. The Fan Blast setting of the Monster (2001) is a welcome addition to the Monster (2001)'s capabilities. The Fan Blast offers the Super Soaker Monster's user the ability to cover a wide area simply by pulling the trigger. Granted, the range of the blast is greatly reduced, but this is the price one pays for greater area coverage. One minor down point to the nozzle settings is that the mount they are on does not feel as sturdy as in other blasters such as the Super Soaker CPS 3000 or Super Soaker Monster X. As such, one feels a slight need to double check that a nozzle is properly locked into place. The nozzles, themselves, do appear to hold a little bit of water after firing. Switching between nozzles can often result in this water trickling out the front. Thanks to the CPS firing chamber, all settings are functional and useful, including the fan spray for dealing with larger group encounters or if one does not feel like aiming as carefully. The transparancy of the barrel makes knowing how much water is pressurized very easy to determine. Quick-fill capability of the Monster (2001) gives any user a good refilling advantage should there be an active Q.F.D. in the vicinity. The shoulder strap and top-mounted handle make this blaster very easy to handle on the field and in the filling station. The body of the Monster (2001) feels fairly sturdy. 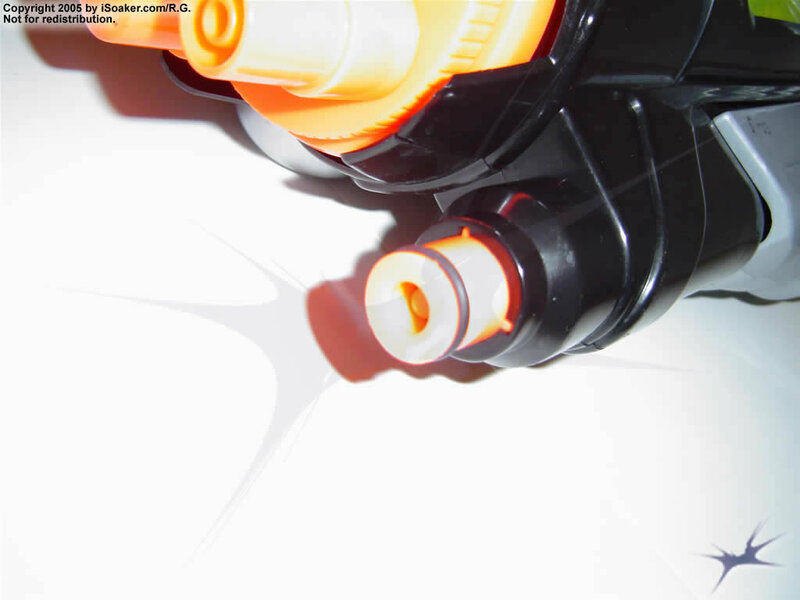 However, certain areas of the blaster do feel a little weaker such as the glide area for the pump shaft. 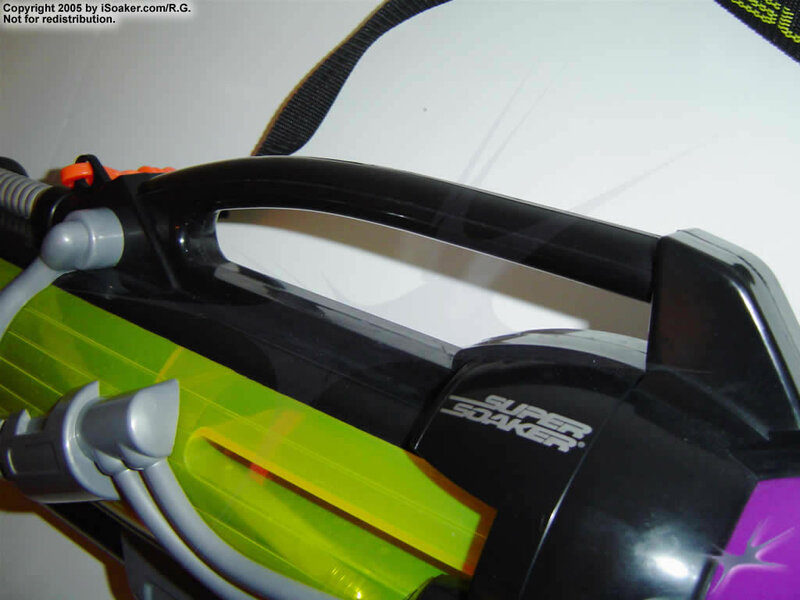 For the minimalist soaker, the Super Soaker Monster (2001) is the iSoaker.com 2001 Blaster of Choice. The four nozzle choices, decent size, SC-capability and CPS power, this blaster can cope with virtually any situation during a water battle. Just remember that it only holds a limited amount of water. A CPS-based, SC-capable, mid-sized water blaster which balances size with power. Four nozzle settings to choose from will meet virtually any soaking need. Pressure chamber indicator, transparent body styling, shoulder strap, and top-mounted handle make up the rest of the kudos. It take many pumps (over 30) to load the firing chamber, but only a few of blinks to empty it. Its styling and multiple nozzles will make most run or get a bunch to gang up one the user. Selecting a nozzle does not feel as certain compared to other multi-nozzle blasters. The nozzles also tend to trap a fair amount of water after firing, resulting in dribble when switching between nozzles during a battle. Before 2001, the Monster line consisted of two very large blasters; there was the Monster which was the more practical option and the XL, which wasn’t at all. 2001 saw the Monster being renamed to the Monster X, to make way for this smaller even more practical Monster. It may be the smallest Monster, but wow, it is still a Monster, and the best Monster of the whole line. Somebody really did quite literally shape up here and man it worked! With the CPS 1700 being replaced by the pile of crap 1-3-5 it is a damn good thing this came along too! The Monster (2001) has so many great things about all round. First off the design and colours look fantastic, I’d say one of the best designs made and the colours just fit in so well giving it that Monster look, holding it and looking in the mirror you look like Arnold Schwarzenegger, combine that with playing AC/DC’s song Big Gun and some sunglasses then you’re set to be stylistic and also soak your opponents hard with water. The pump is tracked, always a plus, it feels sort of shotgun like, in fact the whole feel of the blaster to me is great. The nozzle choices are simple and effective and cover every need. There is 2.5x for that conserving yet still really irritating soak on your opponents, 4x for all out balance of soaking but also not running out quickly, the terrifying long range hard hitting 8.5x which is basically for those impatient people who just want to prove their point straight away, and finally there is Typhoon Blast, which is the least useful, unless you are facing a bunch of people stapled to each other in a group. Pumping is also rather quick and easy, it really doesn’t take long at all. There is also a pressure gauge which like every other CPS blaster that uses one is basically the firing chamber that you can see through the yellow transparent housing on the body of the blaster. Filling the blaster is very easy too with its cool looking reservoir and cap position, the whole thing just flows. Speaking of filling, one of the Monster (2001)’s party pieces like with all the Monsters is it’s quick fill port to allow you to hook it up to a Monster Quick Fill Device (QFD) if one is about, filling both the firing chamber and reservoir completely and compared to its bigger brothers in much less time. This truly is a sleek and effective package. Nothing is perfect, and even things that are perfect have a fault somewhere or others. While there’s nothing massively bad about the Monster (2001) at all, there are some fiddly bits in there. The pump might be tracked, however you need to be careful of the plastic around it as parts of the guide are rather thin and flimsy and can bend like guitar strings if you are idiotic enough to try bending to the limit. The reservoir volume is not bad but it is nothing special either, could do with a bit more, however the amount of full shots you get combined with its firing chamber thankfully balances out well. The trigger might also be a little hard to pull when fully pumped, this is because some internal plastic can get in the way so much that on some models (mine included), it can’t pull back far enough to open the firing valve fully instantly, in which you get some trigger lag. Thankfully, it is a pretty easy fix, and just makes things so smooth. Thanks to its pressure gauge you could just pump a tad less, although I heavily recommend if you’re Monster (2001) has this problem, you do this simple fix. One final little gripe is that it would have been nice if the Typhoon Blast nozzle was an Aquastorm or Power Burst setting like on the bigger Monster’s, however thankfully the stream nozzle’s make up for it given they give you everything you need in terms of flexibility. All in all, a fantastic blaster, one of my personal favourites if not my favourite blaster, it’s hard because my previous favourite was the 1500/1700 which is pretty much the same class of blaster being a mid all rounder. Either way, if you want a dependable, powerful, mobile and sleek looking soaking blaster then the Monster (2001) is it. Not only is it the best blaster of 2001, it is also the best of the entire Monster line and in my book goes down as a respectable contender for one of the best Super Soaker’s ever made. Get round the possible trigger issue you may get which even if you do is easily fixable, and you have yourself a very respectable and capable blaster that with the usual good care will when fighting outblast many, and in terms of durability will outlast lots of things, being a Monster it might even outlast you! Because of the great all roundness you can take on pretty much anything. Backpack Super Chargers and higher end CPS’s are a threat but the Monster (2001) has enough to keep up. It’s great because even less intelligent people like me can use it effectively! Watch out, to be competitive against it use only higher XP’s and CPS blasters, as well as the backpack Super Charger’s. A CPS 1500/1700 would be a good match against a Monster (2001). Being quick is a good advantage. Enter the Monster 2001 edition. Smallest of the Monsters, yet with a longer range than the Monster XL and a slight increase in the amount of water fired per full firing chamber compared to the Monster X. The Monster represents the ideal weapon of choice for those looking for a decent firing speed, rate, distance, etc. The blaster weighs in at just under 4 pounds, which is just fine and dandy for those of us used to carrying around a Monster XL. Some may say that the reservoir is the weakest part of the blaster, but in reality, the Monster only gives up 1.3L of water to the Monster XL and 0.9L of water to the Monster X. The Monster first hit my local ToysRUs store with a $24.99 USD price tag, making it cost HALF that of a Monster XLs. And as a final bonus point, iSoaker.com maintains that it requires "over 30" pumps to load the firing chamber, but 20 pumps will load it for me, making this blaster easier to reload. This nice feature allows those lousy people who like to "hit and run" on reloaders to receive a bucket of water courtesy of the Monster's quick reload time. Trust me, it works. No blaster is perfect however. The Monster does have a smaller water capacity than its older brethren, meaning that those who take full advantage of its longer range and fuller firing chamber will need to make a trip to the hose before the Monster X and XL users do. The body of the blaster is rugged and well constructed, but the body-mounted pump is double-screwed through an upper and lower portion of plastic. This means that a 1cm section of thin plastic runs along the interior where the pump slides when reloading the weapon. The section of plastic is only supported at the ends (the trigger end and nozzle end) of the pump slide, making it likely to crack or bend. So if you like an additional support for your left hand while your right hand has trigger duty, you may not be satisfied with the Monster's construction. Another major disappointment on the blaster is the nozzles. It seems Larami only got the nozzles right on the Monster XL, because the Monster X's nozzles seem stiff when interchanging. The Monster's nozzles are the opposite. They seem to "glide" into place, making it very easy to miss a nozzle setting. Without the feeling of a nozzle "locked" in place, many users will have to trust their eyes to set the nozzles, which is a no-no in the heat of battle. Finally, the hand grip seems designed for an 8-year old. It is shorter than the Monster X and XL hand grip, and also curves too sharply, making the hand feel somewhat uncomfortable on the grip. 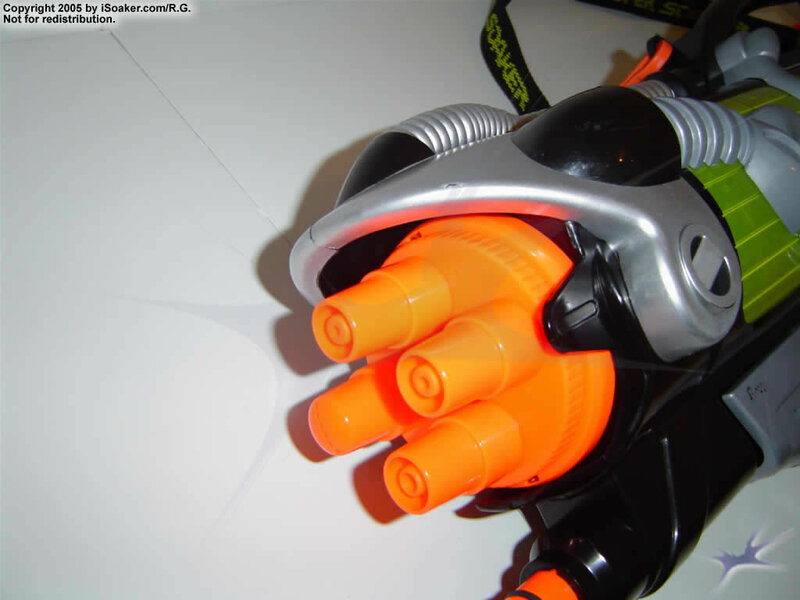 Despite these downfalls, the Monster 2001 edition looks to be the true "workhorse" of the Monster line, combining all desirable aspects of a water blaster while at the same time keeping the price down and the water squirting. If you plan only to buy one blaster for your water fight, buy the Monster and keep it on the 4x nozzle, and you will be the most worry-free and dependable warrior on the battlefield.